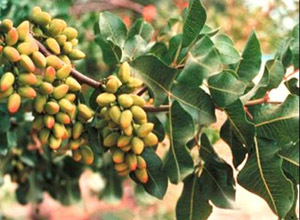 The Pistachio is a small tree up to 10 m tall, it has deciduous pinnate leaves 10-20 cm long.The plants are dioecious, with separate male and female trees. The flowers are apetalous and unisexual, and borne in panicles. The fruit is a drupe, containing an elongated seed (a nut in the culinary sense, but not a true botanical nut) with a hard, whitish shell and a striking light green kernel, having a very characteristic flavour. The kernels are eaten whole, either fresh or roasted and salted, and are also used in ice cream and confections such as baklava.